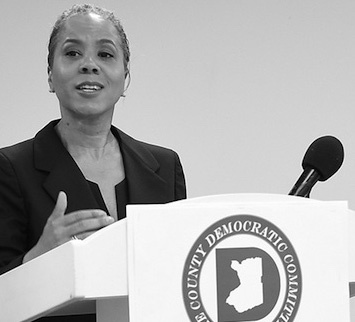 Erie County Democrats endorsed Leecia Eve for New York State Attorney General on Saturday, June 2nd at Erie County Democratic Party headquarters in The Larkin Building in Downtown Buffalo with current and former elected officials, community activists, and supporters in the crowd. 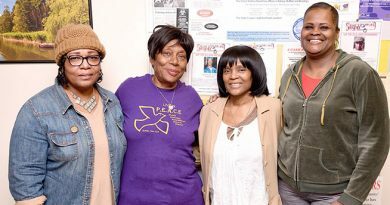 Eve, an accomplished attorney, is the daughter of renowned Buffalo residents – former Deputy Speaker of the New York State Assembly Arthur O. Eve and educator and women’s rights activist Constance B. Eve – who were also in attendance. Eve currently serves as a Commissioner of the Port Authority of New York & New Jersey. She formerly served as the Deputy Secretary for Economic Development for New York and in that role, as the chief economic development advisor to Governor Andrew M. Cuomo. She has held senior roles in the U.S. Senate – first, as previous counsel to former Senator Joseph R. Biden, Jr., ranking member of the U.S. Senate Committee on the Judiciary, where she worked on civil rights and justice issues, and later as counsel and homeland security advisor to then Senator Hillary Rodham Clinton – and also as a key advisor to Clinton’s 2008 presidential bid. “More than ever our great state needs an attorney general who will protect and defend and empower them and who will fight against assaults on our individual rights and our New York and federal constitutional rights. I will stand strong as an independent and passionate advocate for justice in the fight to defend all New Yorkers and help make New York stronger than ever,” said Leecia Eve. “I am humbled and honored to receive the endorsement and support of my hometown democratic party and to have the opportunity to continue my family’s legacy of service to this community and the people of New York State,” Eve continued. 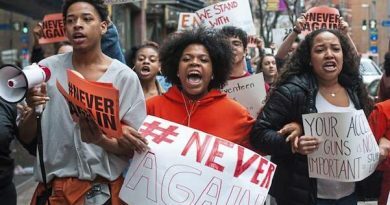 “Leecia Eve is a daughter of Western New York and a woman of Harlem, someone who understands this community and whose roots here could not be stronger or deeper. We need an attorney general who will stand for all New Yorkers, who knows what life is like north of Rockland County and west of the Hudson, one who will restore the public’s faith in the integrity and purpose of this important office. “Not only does Leecia Eve have the government and legal experiences to become our next attorney general, she has a deep commitment to public service that she learned around the dinner table from her parents, Arthur and Constance, who did so much for this community over more than a generation,” said former Erie County Legislator Betty Jean Grant. Eve attended Buffalo public schools and is a graduate of City Honors School. She holds an A.B. from Smith College, a M.P.A. ← 2018 Herculean Fathers Awards!